On 16 August 2012, the African Academy of Sciences (AAS) and the International Organization for Chemical Sciences in Development (IOCD) signed a Memorandum of Understanding intended to foster more collaboration. In a joint statement, the presidents of the two organizations warmly welcomed the opportunity to strengthen education, research, practice, and policy-making in science and technology and to promote the application of science to tackle major challenges of the 21st century. Based in Kenya, AAS was created in 1985 through the initiative of the Third World Academy of Sciences (later the Academy of Sciences for the Developing World). One of its primary functions is to honor African science and technology achievers in Africa. It also acts as a development-oriented mobilizer of the entire African science and technology community to facilitate the development of scientific and technological capacity for science-led development in Africa, promoting excellence and relevance in doing so. Professor Berhanu Abegaz was appointed executive director of AAS in 2011. An Ethiopian chemist, he previously worked at the University of Botswana, where he established the Network for Analytical and Bio-assay Services in Africa with assistance from IOCD. 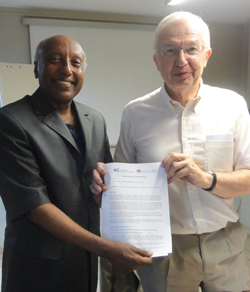 Jean-Marie Lehn, President of IOCD (right), and Berhanu Abegaz, Executive Director of AAS, at the signing of the MOU at a meeting in Namur on 16 August 2012. Registered in Belgium and with an affiliate in the USA, IOCD was established in 1981 under the auspices of UNESCO, as the first international nongovernmental organization devoted to enhancing the role of the chemical sciences in development. In particular, IOCD focuses on enabling chemists in low- and middle-income countries, including those in Africa, to contribute to key science and technology areas for development (see feature). Over a number of years it has conducted work in environmental analytical chemistry, plant chemistry, biodiversity, medicinal chemistry, and chemical education. It has also supported the development of analytical chemistry capacity in low- and middle-income countries, especially in Africa. Professor Alain Krief was appointed executive director of IOCD in 2010. A Belgian chemist at the University of Namur, his interests include synthetic organic chemistry and knowledge-based computer systems for enhancing chemical education and practice. Page last modified 3 January 2013.